Do you want to eat together more often with the people you love? We want to hear about it! In addition to sharing your stories in your own words, we will select five to 10 families who will be paired with our dietitian to help make the task of sitting down to eat together an easier one. We'll also check in once in a while to see if eating together makes a difference in your lives. Elisa Dalla-Giustina, (a.k.a. 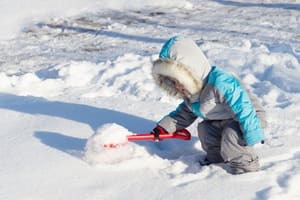 Elisa Loat), from Toronto, lives with her husband, Tim Loat, stepfather to 11-year-old Kai and dad to six-year-old Wes and three-year-old Sam. 1. 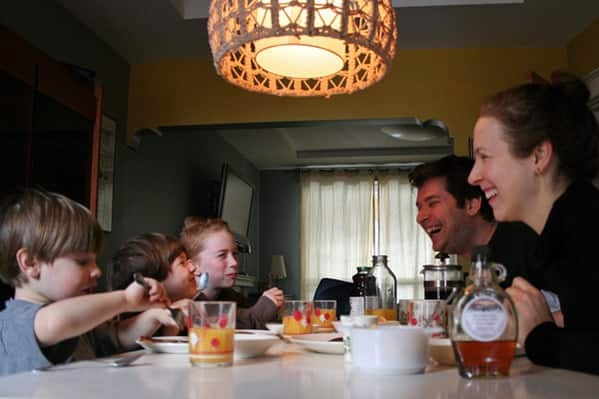 How many people in your family eat together, and why do you think it's important to share meals together? We are definitely a blended modern day family with all the adventures that come with co-parenting/step-parenting and dealing with various schedules (school, work, sports, programs, etc.). Of course this can make it challenging for us to be able to all sit down together and eat as a family. My oldest son, Kai, spends half the week with me, and half the week with his dad, who is within 10 minutes walking distance. Kai eats with us four days a week, Wednesday to Saturday. My husband works long hours and doesn't get home from work until long after the dinner dishes have been washed and put away with the exception of Fridays and Saturdays when he has the day off. That leaves two days a week where we all actually get to sit down and eat a meal together. Generally, our dinners range from three family members to five family members sitting down to a meal together each week. I definitely feel it's important to sit down and share meals together as a family. It allows us all time to reconnect, decompress; and, of course, it allows for plenty of interesting, and often silly, conversations. 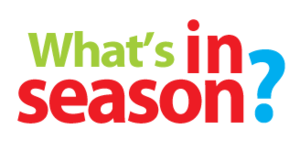 Stefanie Senior is Live Right Now's in-house registered dietitian and has a private nutrition consulting practice downtown Toronto. She is passionate about encouraging families to make healthier choices and specializes in weight management, sports nutrition, chronic health conditions and corporate wellness. First Step: Create a "recipe bank" by writing down or typing out all of the recipes that you know your family already enjoys. Aim to introduce one to two new recipes a month for variety. Second Step: List all of your breakfast, lunch, dinner and snack ideas. You can take it one step further by creating categories such as "quick and easy", "batch recipes", "week day meals" or "weekend meals" and "on the go". Third Step: Use your recipe bank to build weekly menus that highlight WHAT you are going to eat, WHEN you are going to eat it and WHO will be home to enjoy it. Take a close look at your schedule and factor in how much time you will have to prepare, cook and clean up each meal. For example, on the nights that are full of activities, choose a meal from your list of "quick and easy" meal solutions. 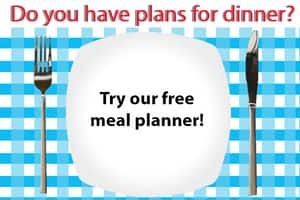 You can also use the Live Right Now's free meal planner to create a sample plan for you and your family, or choose from our database of more than 300 recipes and build your own! Have meal planning obstacles of your own? Email us at LiveRightNow@cbc.ca and we may feature your obstacle with a solution from Stefanie Senior. 2. 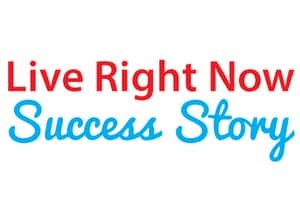 How successful do you feel at sharing meals with your family? For the most part, our family is very successful at sharing meals together. We share meals every night of the week. 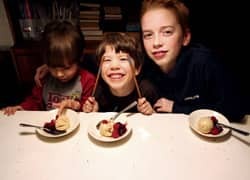 Because our family is used to this, it would be strange for my kids not to eat together. Of course there are always going to be some issues with sharing space with each other - sometimes our youngest tries to steal food off other plates, but it's no different than sharing play space or couch space. 3. What are your mealtime obstacles? I also have to work with kids with varying tastes: one loves vegetables and bread, the other is a meat-and-potatoes kid; and one is very particular about how things are cooked or not cooked. Although they can be picky, I don't make separate meals for them. I try to incorporate things I know they all like and hope for the best! As for dietary requirements, I make sure that the family eats whole organic or sustainable local food as much as possible and that includes our meat as well. I personally have sensitivity to legumes and gluten, so I tend to say away from that, but still provide rye bread for the boys for their lunch sandwiches. I keep the legumes, bread and gluten in the family meals down to a minimum. I like to try new recipes when I can; unfortunately, some of these recipes don't always look that appealing to the boys. But the rule in our house is that they have to at least try four bites before they can refuse it. Most of the time, after the fourth bite, they actually like it and realize that it's the look that has turned them off, not the taste. I usually try these new recipes for dinner and keep the tried-and-tested oldies-but-goodies for breakfast and lunch. I'm fortunate that all my boys love raw veggies like carrots, cucumber, red peppers, celery, etc. There's usually one or two of these raw veggies at every meal - it's our staple. 4. What do you love to eat together as a family? 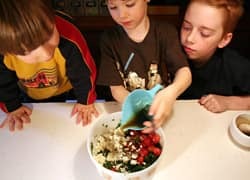 We love to eat plenty of fruits and vegetables but the boys also love pizza, grilled salmon, home-cooked meatballs, pulled pork, and hamburgers. We all love sushi! In the summertime, we like to barbecue and picnic a lot. Also, in the summer, the boys and I will head over to the Leslieville Farmers' Market every Sunday to pick up local food and it's tough not to snack on the fruits and berries we get while we're there. We usually make a little spot by the splash pad and have a little bit to eat from our gatherings. Even though we're not sitting down at a table, we're enjoying a meal together and learning about where it all comes from first hand. The biggest challenges to sharing a meal with my family are a mix of all of the above. In the past year these difficulties are getting less and less. I do feel that I could be more organized with my meals, like creating weekly meal plans. Right now I plan day-to-day. Budgeting and shopping is much easier for us since we started using local organic food delivery service from Mamma Earth Organics. Surprisingly, we actually don't spend much more than we would seeking out our organic fruit and veggies at the grocery store; plus local farms are given a priority with this service so it's a win-win for everyone! I also don't consider myself a great cook, but I'm working on it. I love to look up recipes online, mostly to see what I can come up with for a meal using the food we get through our weekly food basket. Thank you, Elisa Loat, and family for your submission. Do you want to eat together more often with the people you love? We want to hear about it! We are looking for families (however you define family) to feature. We will then select between five and 10 families who will be paired with our dietitian to help make the task of sitting down to eat together an easier one. We'll also check in once in a while to see if eating together makes a difference in your lives. 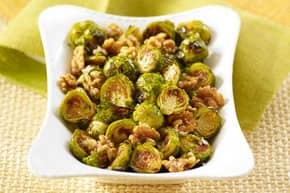 Brussels sprouts are a nutritional dynamo, with Vitamins A and C, fibre and iron.